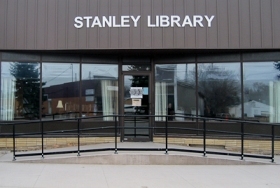 During December, the Stanley Public Library held a Reading for Rewards contest for students in grades K-6. Students checked out library books, read and returned them for an entry into the contest. The winner for December was Pierce Tronset, who read a book titled “Spiderman.” Pierce won a $25 Visa gift card sponsored by Braddock Insurance. A total of 47 books were read for the contest. Congratulations to Pierce and all the contestants! The Stanley Public Library will be closed December 31 and January 1 in observance of New Year’s Eve and New Year’s Day. The library will be open Wednesday, January 2 at 12:30 PM. During December, the Stanley Public Library held a Holly Jolly Christmas Candy Contest. Kids were invited to view the Christmas box and guess the number of items in the box. Mackenna Hanson was the winner with a guess of 453. The box contained 449 items. Congratulations to Mackenna and all the entrants! The contest was sponsored by the Friends of the Library. The Stanley Public Library will be closed December 24 and 25 in observance of Christmas. The library will be open Wednesday, December 26 at 12:30 PM. Join us at the Stanley Public Library for the Christmas Stroll on Friday, December 14 from 2-4:30. Coffee, cider and Christmas goodies will be served. There will be used books and movies for sale along with the Stanley Library souvenir playing cards and the “Tales of Mighty Mountrail” books.